Offering countless obeisances to Asmath Acharyar, Sri Sri Mudaliandan Swamy and all spiritual masters , Adiyen wishes to share our travel and darisanam experiences at Thirunangoor done few years back . We had attended this great festival twice and wish to share the divine experiences to all the devotees . It will be a great fortune and mercy for the ones who will be attending this year festival on Thai Amavasai which is being celebrated from 04-02-2019 to 05-02-2019 at Thirunangoor and get the blessings of our Thirumanga Azhwar . Watch the clip and get in that mood of devotion …. The remote village of Thirunangoor near Sirkazhi reverberates with satsangh every year Thai Amavasya and the succeeding 2 days are celebrated in a very grand manner. 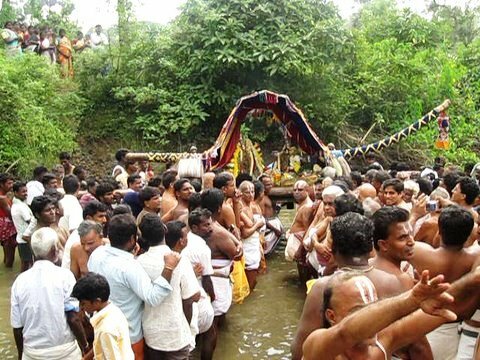 On Thai Amavasya, Thirumangai Azhwar the great saint of Vaishnava sampradaya is given Manjal Kuliyal (holy bath with turmeric water) which is being celebrated in this remote village past 12 centuries . 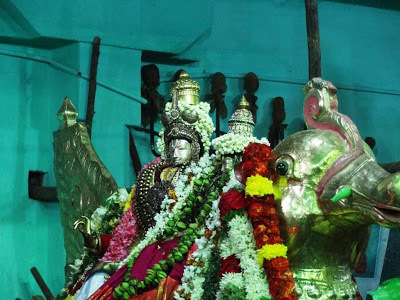 The next day, 11 Garuda Seva of LORD is celebrated which is being done since past 100 years .The third day marks the return of Azhwar to Tiruvali-Thirunagari temple. Srivaishnavas make it a point to participate in these festivities. 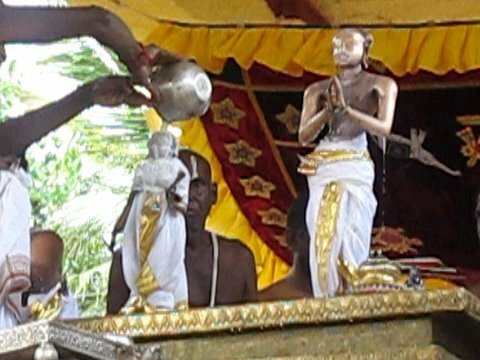 MANJAL NEERATAM AND ELEVEN GARUDA SEVAS HELD AT THIRUNANGOOR EVERY YEAR ON THAI AMAVASAI AND PRADHAMAI DAY respectively. May the Supreme Lord bestow me the knowledge to describe about the Garuda Seva. Adiyen seeks the blessings of all the devotees , Acharyas and Azhwars for describing the great event . Thirumangai Azhwar affectionately called as Kaliyan, was the valiant army chief of the then Chola King that the king gifted him with a small territory to rule over. Hence, he was known as Thirumangai Mannan . He was attracted to an apsara Kumudavalli , daughter of a physician and expressed his desire to marry her. Kumudavalli who appeared on this earth to transform this valiant king to a devotee , laid the condition that he should serve 1000 Srivaishnavas every day by offering Prasadam for one year . 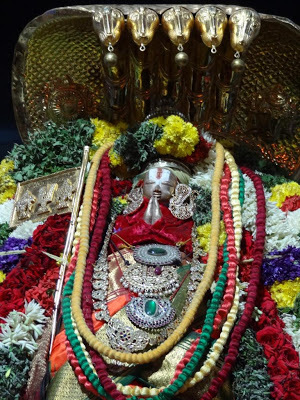 Thirumangai Mannan fulfilled her condition and continued to do so even after his marriage as he got habituated in this wonderful kainkaryam of feeding the srivaishnavas. 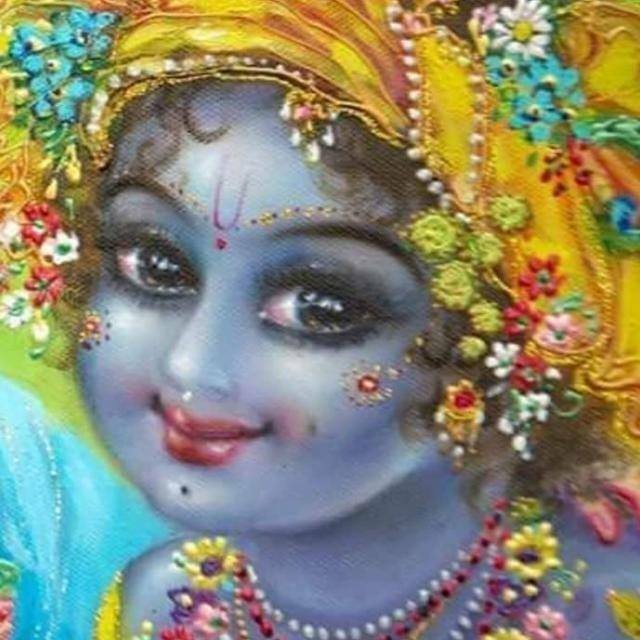 In due course, his wealth diminished and as Lord Krishna says in Bhagavad Gita, when HE decides to bless HIS devotee, HE takes away wealth and enacted a divya leela. 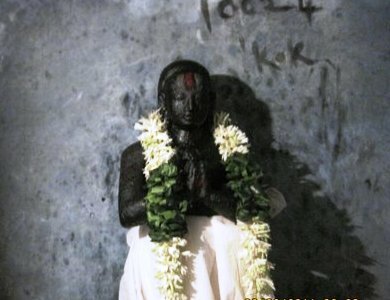 Due to his love for vaishnavas , our Azhwar resorted to stealing and plundering wealth from the rich and the egoistic but used the wealth for feeding Vaishnavas and renovating temples. One day , Tirumangai Mannan comes to know through his friends that a newly wedded couple bedecked with precious jewellery were passing through a forest in a palanquin and if they could plunder their wealth, they could continue with their cause of serving Srivaishnavas forever. Overjoyed , Thirumangai Mannan along with his four friends rush to the place in the midnight , galloping fast on his horse, who he calls as Aadalmaa. 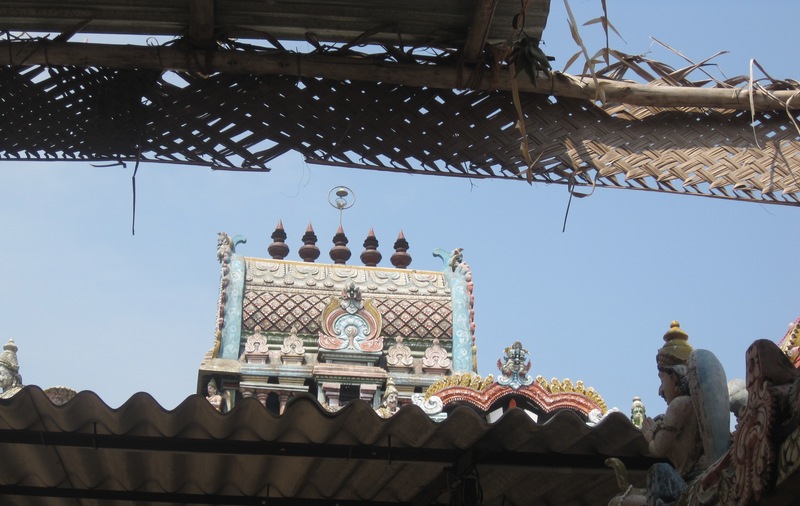 He waylays the divine couple who are resting near a mandapam at “Thirumanankollai” and plunders their wealth. This precious booty is carefully put over a cloth and ties it . Not being satisfied with the loot, he advances towards them and tries to remove the Thirumetti of Thayar with all his might but is unsuccessful. 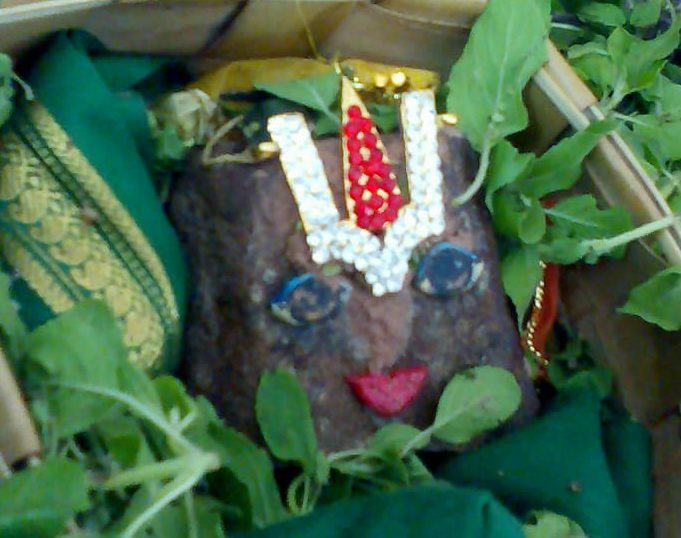 By coming in contact with Thayar’s thiruvadi, realisation dawns on him. He is amazed .Something draws him towards them for a second look . However he manages and when he tries to lift the loot, he is unable to do so. He suspects the bridegroom for having put some charm on the loot . He threatens Perumal who is disguised as the bridegroom with a sword to disclose the secret which is not allowing him to lift the loot . Perumal smiles at him . He advises him to purify himself by having a dip at the Kavery tributary and return so that he can impart the secret to him. Thirumangai mannan politely obeys the advise . He returns to Perumal. Lord gives him the most sacred mantram,Thirumantram . The moment Perumal whispers the sacred Ashtakshari Thirumantram , wisdom dawns on Kaliyan and he surrenders at the Lotus feet of the Divya Dampadhigal. “Vaadinene Vaadi….” and decides to glorify Perumal by visiting holy places in India.. He is transformed as Thirumangai Azhwar and riding on his Aadalma horse glorified Perumal in about 86 divya desams. With the directions given by senior devotees we reached Thirunangoor in the evening and discussing about the divine pastimes of Azhwars with elders . Though we did not have a proper resting place all of us relaxed lying down at the temple entrance awaiting Azhwars arrival as it was almost midnight when we reached Thirunangoor. 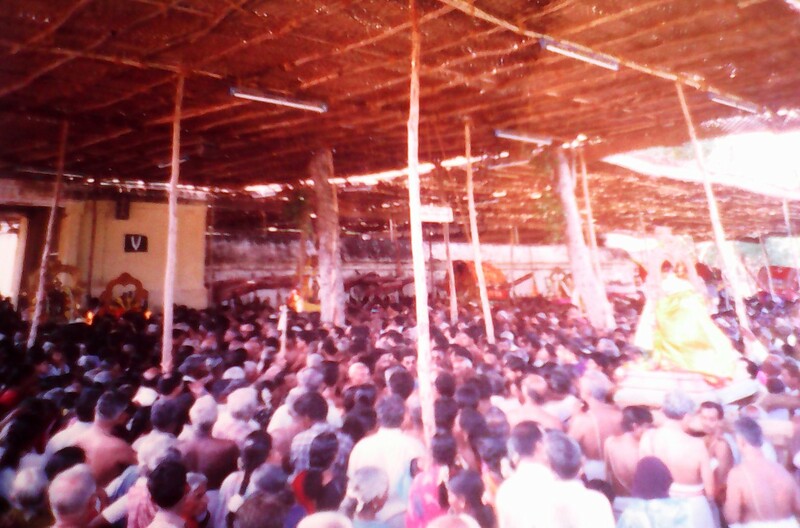 The village of Thirunangoor is fully crowded with many devotees . We all relaxed in front of a house near Thirunagari temple. Suddenly around 1.30 A.M. in the early morning, we were awakened by sounds of crackers and trumpets . The drums and Nadaswaram were being played to welcome our Azhwar . On enquiry, we were told that Azhwar’s purapaadu ( procession ) was about to start and Azhwar was being dressed as the chief . Adiyen was keen to join the procession amongst many many senior devotees and the excitement in following Azhwar . Un mindful adiyen took a shower near a bore well and quickly changed my clothes and applying Urdhvapundram ran behind the crowd to be as close to Azhwar and the devoted priests . It was totally dark with few street lights which were going ON and Off and sad that there were no proper roads. Unmindful of the thorns and stones, all the bhagavathas were literally running behind the Azhwar as some one is waiting for us . The all compassionate LORD is so keen to meet the Azhwar for his upliftment . Adiyen had the same feeling . As it was too difficult to carry children in the crowd my family followed us by hiring a motor car amongst other devotees . This unique devotion of the villagers and the devotees coming from far off places has to be seen in person to taste the bliss . 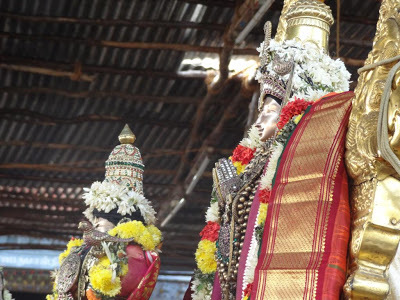 The holy intention of the procession ( purapaadu) is Azhwar personally goes to each of the 11 temples, glorifies the respective Perumals while going for Manjal Neeratam and personally invites the LORDSHIPS to grace them to come to Thirumanimaada kovil for the Garuda utsava darshanam which will be held the next day.
. Let me attempt to narrate the happenings in the chilly night of Amavasai . 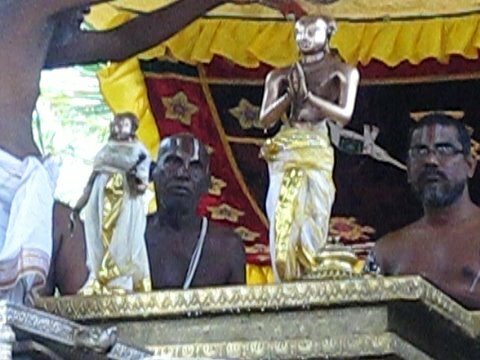 Our Azhwar (Thirumangai Azhwar) was seated majestically in a well-decorated palanquin and the procession started from the temple Azhwar proceeds to Thirukuraiyalur, his birth place. The crowd braves the chilly weather to somehow occupy the temple corridor to have the closest darshan of Azhwar and Perumal . It was 2.30 AM when we reached this temple . We could see hundreds of devotees following the procession . The Azhwar literally runs and the bhagavathas also run behind the azhwar. Adiyen participated in the procession and literally was in bliss being with advanced devotees . It was a memorable trek for spiritual quest .The zeal cannot be explained. We are in THIRUKURAIYALUR, the appearance place of Thirumangai Alwar. The Temple Priest along with the senior devotees receive Azhwar with due temple honours and mangalasaasanams. The first pasuram starting with “VAADINEN VAADI” was recited . It was as if Azhwar was almost there guiding us . The pasuram literally brought chilled tears in my eyes . Adiyen was able to feel the soul literally craving for HIS grace and the nectar was directly being fed . Was able to meet bhagavathaas who were carrying out “PUSHPA KAINKARYAM FOR THE AZHWAR ON THESE TWO DAYS”. Ahead of this recitation we were offered hot prasadam ( Kesaree) .This prasadam became a benchmark for me to offer it LORD later . After honouring the prasadam adiyen moved near to the temple premises where the devotees were thinning away . Offered humble obesiances to LORD NARASINGA PERUMAL and prayed LORD to bestow his abundant mercy in having satsangh always . 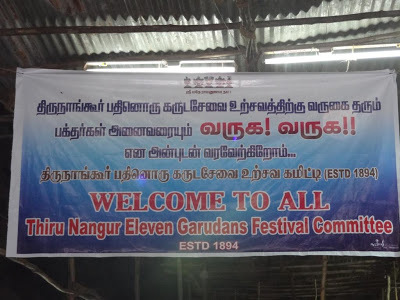 The special feature in this big festival is that without any discretion, all the residents of the 11 villages participate in this function and the hospitality extended by the local residents cannot be described in words. They all consider it as their own family function. Now our Azhwar proceeds to THIRUMANGAIMAADAM , the birth place of Kumudavalli Thayar., who was solely responsible for transforming our Azhwar into a Srivaishnavite. It’s a very old temple and the darshan of Azhwar specifically at this place reveals his liking to this place and his consort . After recitation of the respective pasurams and mangalashashanams , we were offered Chakrapongal prasadam which was honoured . The sweet prasad , the sweet pasurams , the sweet crowd and our SWEET AZHWAR was indeed most memorable night . On looking at the watch , Adiyen was amazed ,It was already 3.30 AM and was looking as fresh . Never was Adiyen awake except for the Suprabatha seva at Tirumala Hills . We must have around 4 Kms . 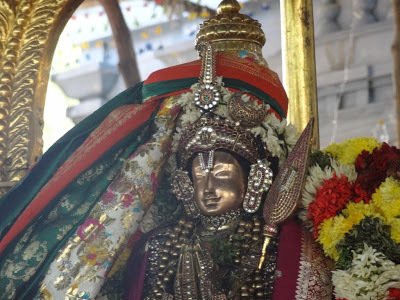 scattered around for about 10 kms and as done in the temples our Azhwar requests Perumal to grace the garuda Utsavam the nest day after reciting the prescribed pasurams of the Divya desams . Few temples the time taken is more as per the number of Pasurams .Adiyen was fortunate to be around the learned bhagavathas and advanced devotees who were literally up to date with the history of temple and Azhwars pastimes . All these temples are scattered in a radius of 10 to 12 kms .Unmindful of the darkness , poor roads and route followed each of us were moving in a brisk pace to match the speed of the Procession . We must congratualate the palaquin bearers of Azhwar who are so energetic and infuse the spirit to just keep moving seeking his mercy . The whole place is charged with religious fervour and was eye- captivating. One must not miss to see bhagavatha’s bhakti for the Azhwar. 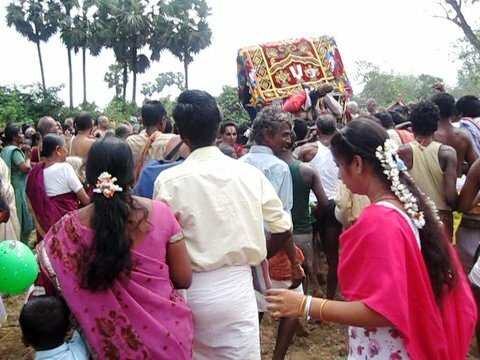 Due to Azhwar’s sheer grace, Adiyen was able to participate in the procession. The procession was more or less like a running race. 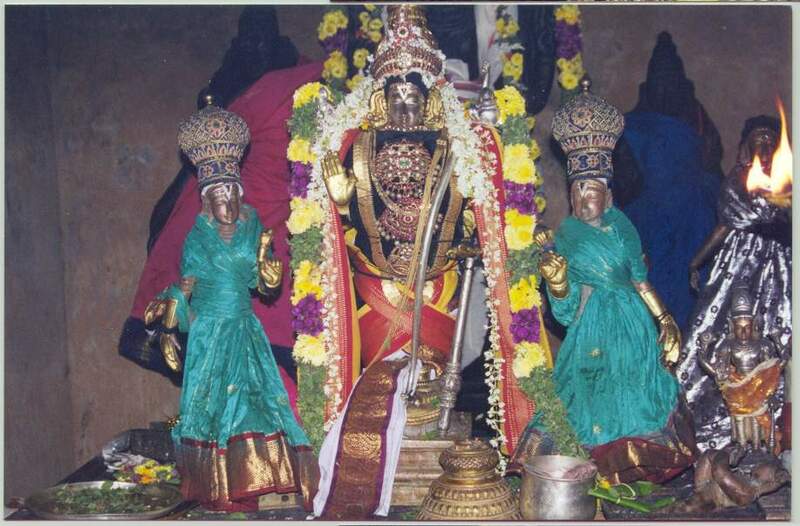 It shows the Azhwar’s anxiety to have darshan of Perumal at different divya desams . …LORD moves few miles to reach him .All through the way, Perumal’s naamasmaranam was done and Azhwar’s vaibhavam was recapitulated. Even the thorns and stones on the road become flowers to the devotees now .Enjoying the company of a senior devotee adiyen suddenly noticed Azhwars procession moving inside a field lushy and so green . For a moment, was totally confused . Adiyen didn’t know what was happening. The senior devotee explained that it was Azhwar’s practice to go across fields, muddy lands and canals during his times and as a mark of respect the procession goes in the similar fashion and that practice is followed even today. It was a very thrilling experience. 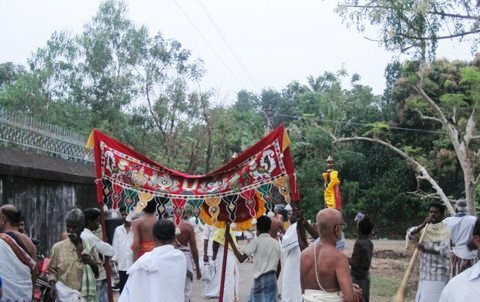 Around 8-10 bhagavathas were shouldering the palanquin and by seeing the speed in which the procession was taken, Adiyen thought they may drop the palanquin. But was corrected about my misconception by other bhagavathas that such incidents do not happen and Azhwar enjoys the procession to be taken in this way. Adiyen decided to accompany the procession in the damp fields along with the bhagavathas though was bit apprehensive about slipping in the green fields . Adiyen never ever felt that we were in the fields . We along with Azhwar cross the agricultural fields, (keni kattu), canals etc. One young devotee was sharing his experience that the local people request the procession to be taken across their fields because they strongly believe that Azhwars mercy on them will have a good yield if the procession goes from their fields. It takes about half a day for our Azhwar to cover these 5 temples. After inviting the Perumals in these five divyadesams it is almost the next day afternoon . 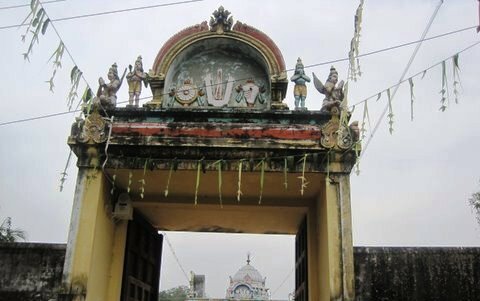 On the banks of the canal, Azhwar does mangalasaasanam to his Acharyar , Sri Naraiyur Nambi Perumal (Naachiyar kovil, Kumbakonam) who personally initiated him into Vaishnavism and mangalasaasanam to his favourite Perumal, Sri Ranganathar . The Divyaprabhanda pasurams takes you literally to the divyadesam along with Azhwar . 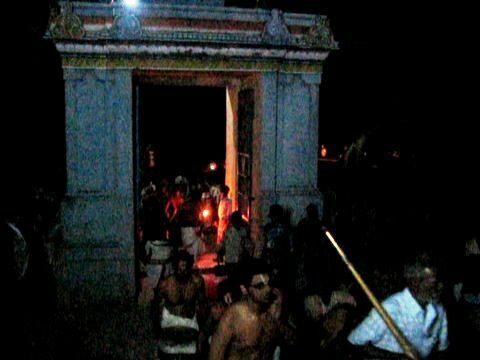 An interesting happening takes place .The Priests along with bhgavathas stood in knee deep water reciting pasurams on LORD Thirunaraiyur Nambi and Sri Ranganathar. Our Azhwar takes a quick dip in the canal . Along with the Azhwar, all the devotees also had a holy dip. One devotee informed that Azhwar, when he was the chief ,he used to have bath in these waters for refreshing himself after he returned from his looting expedition. Hence, the old practice of having holy dip in the Manikarnikai waters is still followed even today. 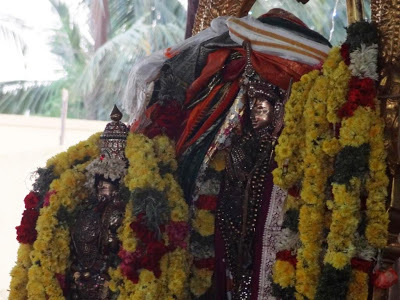 Azhwar is now honoured with garlands and peethambarams which were adorned by the two Perumals of the divya desams previously. These gifts are specially brought from Kumbakonam and Srirangam with due temple honours. Now our Azhwar proceeds to a nearby old mandapam well decorated for Manjal Neeratam..
Thirumangai Azhwar and Kumudavalli Thayar. It is very interesting to note that Azwar is never separated from Thayar except on one occasion i.e. 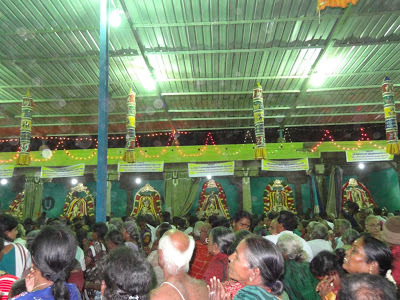 during THIRUVEDUPURI UTSAVAM celebrated during Panguni Uthiram day every year in April. Only during this occasion, Azhwar leaves Kumudavalli Thayar alone for a span of 3-4 hours as he goes to rob Perumal’s properties and eventually transforms to become HIS only property . We are now in the Mandapam premises . A sahsradhaara plate where the Azhwar deities are honoured with a holy bath . Its a great bhagyam to have darisanam of Azhwar when the holy water of his deities is allowed to bathe the divine couple who have showed us the path of surrender to our only LORD SRIMAN NARAYANA. Adiyen was fully charged amongst the bhagavathas . Few senior bhagavathas sang Azhwars Pasurams with some dancing to the tunes . Overall the festive atmosphere infused more and more bhakthi and adiyen found there was some special attraction in our Azhwars bewitching smile . Reflecting on Azhwars pastimes adiyen reclined at the mandapam premises sometimes with tearful eyes thanking Azhwar and Asmath Acharyar for blessing me to be among this wonderful devotees who are in the trance of HARINAAM all the while . At about 6 P.M., Azhwar reaches Thirumanimada kovil popularly known as Narayana Perumal kovil. It is here that 11 Garuda sevai is performed. The garuda vahanams of all Perumals are kept here in designated mandapams. 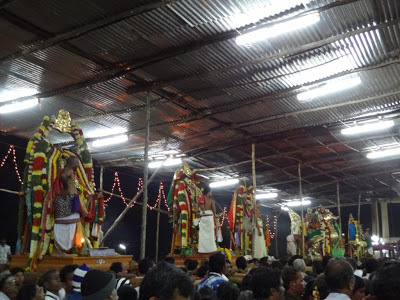 Azhwar is greeted as usual and pasurams comprising of Thirupallandu, Kanninunsiruthambhu, respective pasuram from Peria Thirumozhi are recited followed by neivedyam, saatrumarai and vaazhi thirunaamam. Azhwar then visits Thiruvanpurushothaman kovil where professional musicians entertain Azhwar by exhibiting their talent in playing nadaswaram and mrudangam . After mangalasaasanam, Azhwar visits Manavaala maamunigal sannidhi in the temple precincts. 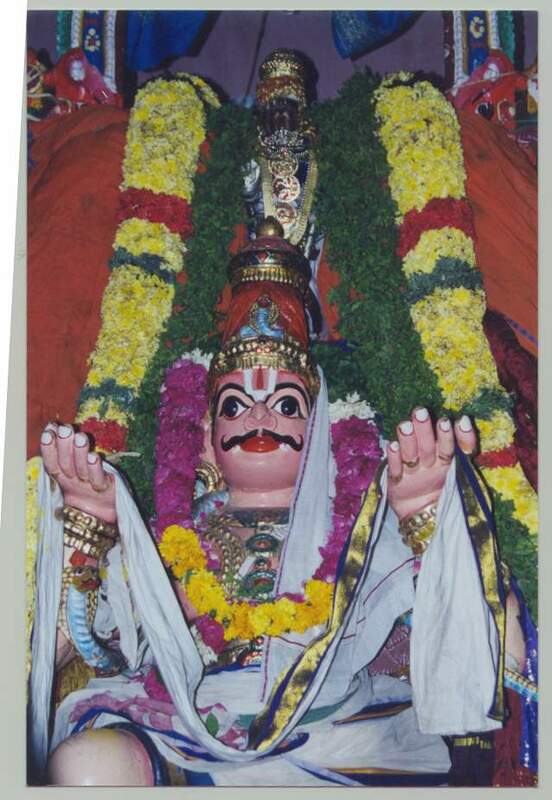 Azhwar was one of the favourites for Manavala mamunigal mamunigal organizes the 11 garuda seva on the following day. We were offered prasadam , panchaamrutham, chakarai pongal etc sumptously . The Manjal Neeratam is still fresh in our minds. May Azhwar bless us by giving us many many more oppurtunities to be amongst his devotees It was almost 3 P.M now . As per the plan , the procession re started. 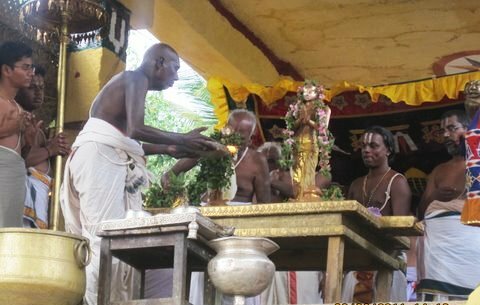 Azhwar now marches to THIRUMANIMADAKOVIL , THIRUNAGARI and glorifies the Perumals to grace the function the next day . Prasadam is offered at every Divyadesam to the devotees . and following the same custom of reciting the divyaprabhanda pasurams glorified by Azhwar at the respective divya desams. 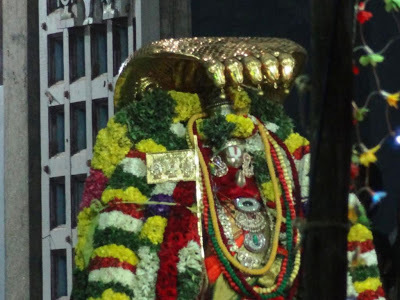 We were overjoyed to be among a sea of devotees and managed to take rest in open area and moved to the premises of Srinivasa Perumal kovil more popularly known as “Annan Kovil “ and passed the night at temple along with devotees . The next day morning, all of us assembled at Thirumanimada kovil for participating in the most awaited 11 GARUDA SEVA. 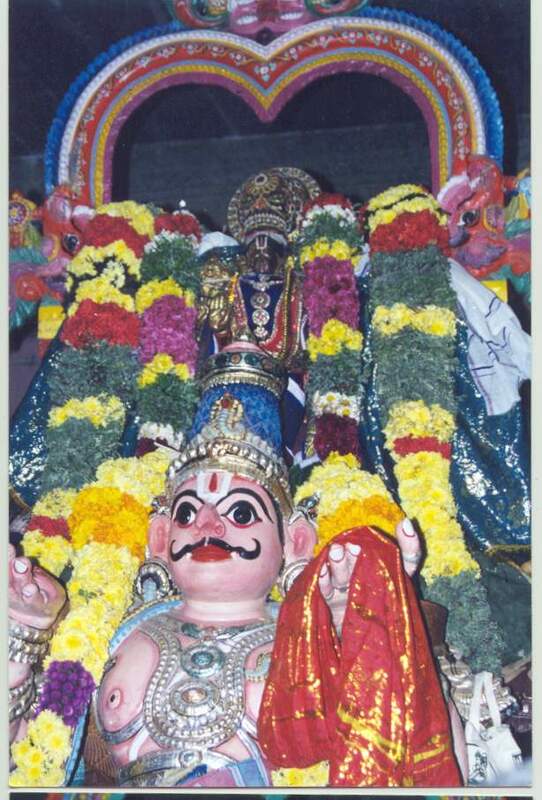 Adiyen took this small oppurtunity to have darisanam of Anann kovil,, Thirupaarthanpalli, Thiruvaali-Thirunagari before proceeding to attend the Eleven Garuda sevai . Offering repeated obesiances to our Azhwar in Thirunagari temple. The temple itself is very big. The deity of Thirumangai Azhwar along with Kumudavalli Thayar is eye captivating. It makes one recollect Acharyar Manavala mamuni’s thaniyan . Azhwar’s lips are slightly opened as if they are uttering THIRUMANTRAM. 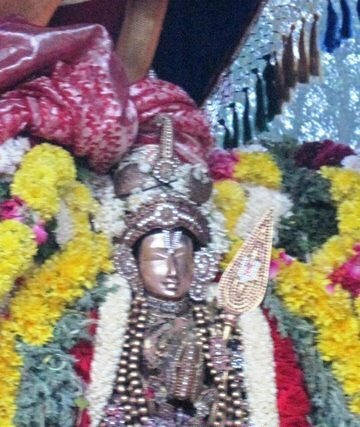 Azhwar is seen holding THIRUMADAL in one hand and has a spear with him. Azhwar is seen wearing anklet. This anklet and Vel were given as gifts to the Azhwar when he won in a contest about Vaishnavism with a advanced saiva devotee Thirugyanasambandhar . From 10 A.M. onwards we can have darhanam of divya desa Perumals from each temple who accept the Invitation of Azhwar We are able to observe a big pandal erected for the Perumals. Almost by 4 P.M. all Perumals from 11 divya desams arrive and take the gaurd of honour from our Azhwar as our Azhwar arrives to recieve our most reverred guest of the wonderful seva from Thirumanimada kovil for receiving the Perumals. Our Azhwar awaits near the entrance of the temple. Acharyar Manavala maamuni awaits facing our Azhwar. 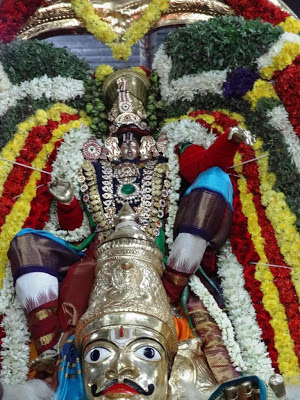 , Swamy Manavalamaamuni was very fond of Thirumangai Azhwar and he , as a disciple supervises this grand Garuda Utsavam . The place was over crowded but fortunately we could have a clear view of the proceedings and were able to have good darisanam . 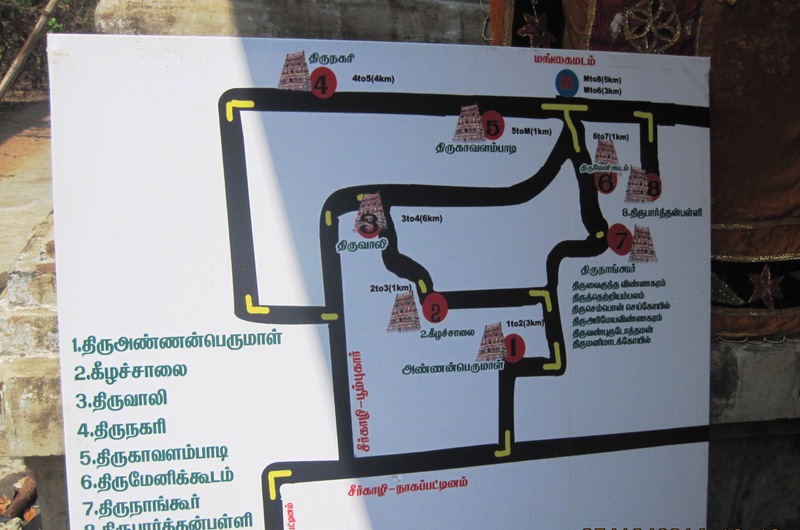 To enable the crowd to know about the proceedings, a big board was hung depicting the particular Perumal’s Thirunaamam, and Divya desam.
. Now the honoured Perumal gets inside the Thirumani mada kovil. An interesting feature noted was there was a separate troop of musicians who played naadaswaram, mela and thalam for each Divyadesam Perumal. 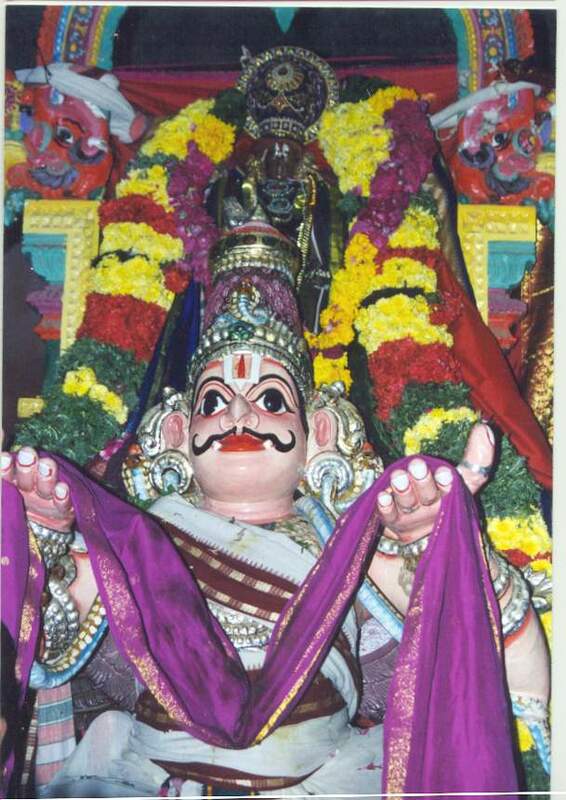 1) THIRUNARAYANA PERUMAL OF THIRU MANIMADA KOVIL- adorned in white colour dress .
. Around 11 P.M. , the Garuda seva starts. We quickly come out of the temple and eagerly await to have the Garuda seva darshanam of all the Perumals . We observe the moment the main door opens our Acharyar Swamy Manavala mamuni followed by Thirumangai Azhwar and Kumudavalli Thayar seated on hamsa vahanam arrive much to the joy of the devotees . 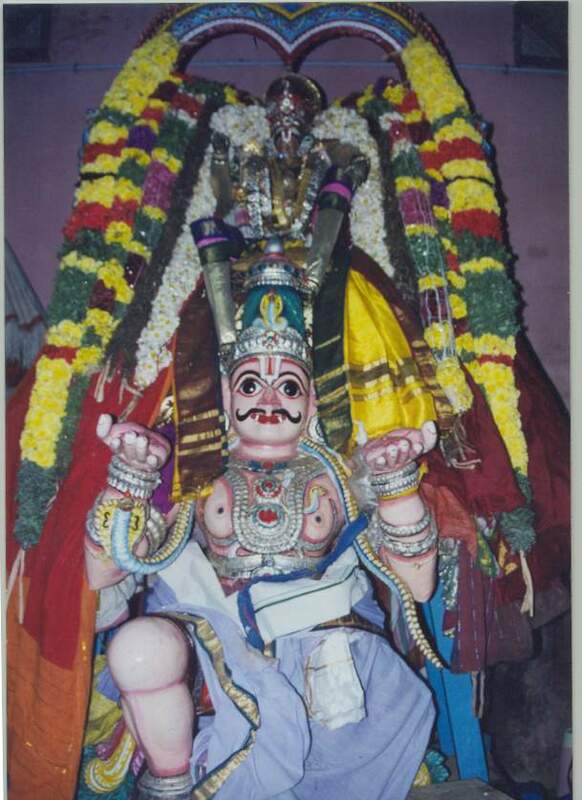 Swamy Manavaala mamunigal in his parangi naarkali vahanam comes out first and receives Azhwar seated on Hamsa vahanam. One by one all the Divya desam Perumals arrive in Garuda vaahanams. Mangalasaasanam sung by Azhwar is recited and after due honours, the Perumal goes round the 4 mada streets..
On the third day, after all the divyadesa Perumals leave to their respective divyadesams, Azhwar also leaves Manimada kovil.. On the way he visits Annan Kovil where he is received grandly as he is considered as their “Maapillai”(son-in-law”). 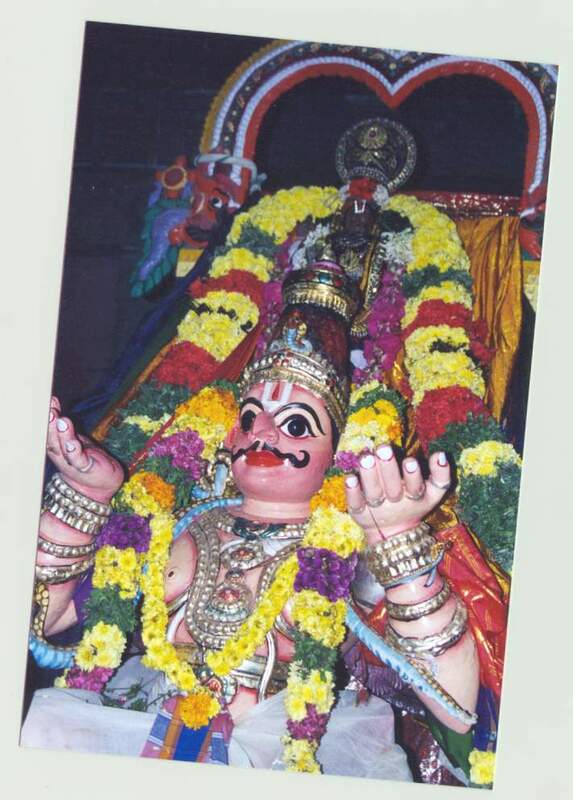 Finally Azhwar reaches Thirunagari where Vayalaali Manavalan-the presiding diety of Thiruvali-Thirunagari temple waits near the entrance on Garuda Vaahanam to welcome Azhwar . Perumal and Azhwar then enter into the temple together. This marks the end of the three day festivities at Thirunangoor which is celebrated for more than 140 years. Adiyen with tears submit to the divine will of Azhwar and Almighty who graced us tohave the darishna bhagyam amongst several devotees . What else does a soul needs except HIS cool benovalent grace always to be among Haribhaktaas………..
Nadu nagaramum NAMO NARAYANA enru ..
Thats the final prayer LORD .. Please forgive adiyen for any slips in glorifying and describing the great festival .